Atlanta has hot, humid summers and cool winters. What does that mean for homeowners? It means there is a potential of foundation problems in the homes in Atlanta, Georgia. When the temperatures change as frequently as they do in our great city, the soil around your foundation or crawl space can easily shrink and expand. With the amount of rainfall we see, you can also count on excess water in the soil, which can put hydrostatic pressure on the walls of your basement, causing them to bow and lean. When you see this occur, it is time to call the basement foundation repair professionals at Atlas Piers of Atlanta. If you notice cracks in your basement wall you will need to seek out a professional to better assess the problem before you think of the solution. Atlas Piers is located right here in Atlanta so we can get to your problem fast. With a quick response, it can’t get worse and you are protecting the investment you have in your home. 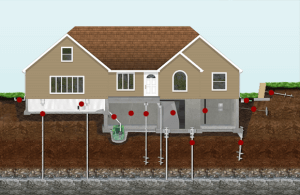 Basement foundation repairs are much less expensive to fix than foundation failure. Atlas Piers specializes in underpinning products and installation including helical piers, resistance piers, and helical slab piers. We use only the very best in underpinning products from Earth Contact Products. These products rank as some of the world’s best, and have a reputation we would stake our reputation on. You can count on the ECP foundation repair solutions and our well-trained installation staff to make sure your job gets done right the first time. Underpinning is one of the most common foundation repair solutions that we use here at Atlas Piers. The installation of resistance piers to lift and stabilize a foundation, or underpinning, is our specialty. The process begins with a resistance pier being driven deep into the ground beneath the foundation until it reaches stable soils. Next, the weight of the entire structure is transferred onto the piers. Once the weight is transferred, the piers can support the foundation, lifting it to its original position. Although they all work in the same general manner, we offer a variety of piers to fit every situation: helical piers, steel push piers, slab piers, porch piers, and new construction piers. Another common solution for sinking or settling foundations is pressure grouting. This is a method used to fill voids that may have formed underneath your foundation. If these voids form (usually due to erosion or soil shrinkage), pressure grouting is the way to go. A high strength grout is injected under the foundation to fill the voids. This grout acts as a stabilizer, providing adequate support to lift the foundation and keep it sturdy. Atlas Piers has the resources to fix these problems with minimal damage to your property and wallet. We utilize helical tiebacks in situations like these. Helical tiebacks are attached to the inside of the basement wall, and are then hooked underground outside the structure. By doing this, we alleviate some of the pressure on the walls and are able to take out any bowing or leaning that might be happening. Moisture in your home is never a good thing. It can cause mold and mildew that will damage your home and your health. Mold releases spores and these spores will affect the air you breathe. Water takes the path of least resistance, so if there is a crack in your basement its guaranteed that water will seep through. Mold is noticeable by its smell, if you notice a musty odor while in your basement then it’s time call a professional. We also offer crawl space encapsulation to combat mold growth. If you have a crawl space, inevitably moisture will be an issue. Concrete allows moisture in, and that can turn into mold, mildew, bad odors, and air that is not safe for your family to breathe. With our encapsulation process and vapor barrier installation you will have air that is clean to breathe, a dry space to store things in your Atlanta home, and lower utility bills. You can count on us for a dry, safe, crawl space. If you are having a shoring repair problems we also specialize in that. Shoring is important and shouldn’t be taken lightly. Your property could become damaged if you don’t take immediate action. We have designed and engineered foundation repair products that can re-position your foundation to its original position. For these solutions and so much more, count on the basement foundation repair team at Atlas Piers of Atlanta. Let us get to work for you and protect you foundation and your home. We will give you an estimate as to what your foundation repair will cost before we do the work. Call us today!